Alicia Cardina began working at Carolina Day School in 2010. 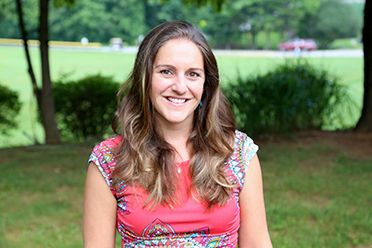 After earning her undergraduate degree in psychology and music at Hamilton College, Alicia went to Lesley University to earn her Master of Elementary Education. She then accepted a teaching position at the Antilles School on St. Thomas, USVI, and taught first and second grade for three years on island. During her teaching career she has received the level I and II trainings in Responsive Classroom, a week long training at Harvard Project Zero Classroom, and most recently a training in leading Paideia Seminars. She recently became a Consulting Teacher for Responsive Classroom, which enables her to teach the Responsive Classroom approach throughout the nation during the summers. After the three years in the Caribbean, Alicia moved to San Lucas Sacatepequez, Guatemala to volunteer at the Casa Shalom Orphanage and Colegio Shalom (school). “That was an incredible experience; one that broadened my appreciation for Latin American culture while learning from and helping others in unique and challenging situations,” said Alicia. Alicia also has an extensive background in vocal and instrumental music that she brings to her position at CDS. “I have a love for singing, writing music, playing piano, guitar, and dance,” said Alicia. In what ways can you teach/engage children at CDS that you couldn't at other schools? "CDS is a very unique place to teach at because each teacher’s gifts are honored, and we are able to bring our passions into the classroom. Specifically, I have been able to integrate my love for music into so much of my teaching experience. Because such a strong core belief of our school is working in partnership, we are able to get to know families on a much more personal and meaningful level. I am able to support the whole child, and especially the social/emotional aspects of their development. Because we are not wed to a mandated curriculum I am able to take the wonderful tangents of learning and allow the students to really dive into real learning and inquiry." What do you like most about your job at CDS? "I am extremely blessed to be at CDS because of the community of teachers, children and families. I value knowing that as much as I love and care for my students, I am equally loved and supported by my fellow CDS community members. I love that CDS has allowed me to attend several professional development opportunities, including Responsive Classroom Institute, Paideia Seminar, and Singapore Math. When I come to school each morning, I know that I will be surrounded by individuals who embrace positivity, seeing the potential and gifts in each child, and teachers who are always looking for new ways to improve their approach to education." In your opinion, how does the CDS community inspire students to be courageous and curious, wonder about things that they don’t understand, try new things, and develop individual passions? "As a fifth grade teacher I enjoy modeling and emphasizing the importance of honoring our individual gifts and challenges. We allow students to work together and explore topics of interest within our curriculum through Academic Choice and inquiry based learning. We also embrace when students share their at-home experiences within our classroom studies as we recognize how this deepens their overall growth and understanding of our diverse community." How would you describe your classroom? "My classroom is inviting, warm, lively, and full of creativity and passion! I strive to maintain a learning environment that supports all kinds of learners, and also exposes them to many perspectives and different cultures. I do this through music, multicultural stories, and art. I like to keep a gentle and calm approach while also engaging students in a positive and lively conversations and activities." What books and authors inspire you? "I love the publications from the Center for Responsive Schools, the resources of Responsive Classroom. In particular, “The Joyful Classroom” and “The Power of Our Words.” I am a lover of poetry, and am especially fond of the mystic poets Hafiz and Rumi.” Daring Greatly,” by Brene Brown is one of my favorite books for it influences who I am as a teacher, and reminds me that even as adults we are continuously growing and changing to express our most authentic selves. The idea of “daring greatly” helps me go out on a limb at times as a faculty member, or helps me inspire children to do the same within the classroom."